Golden Biotechnology Corporation (GBC) was founded in 2002, is an innovative drug discovery and herbal supplement company dedicated to enhance lives by developing high quality products that prevent and treat diseases. 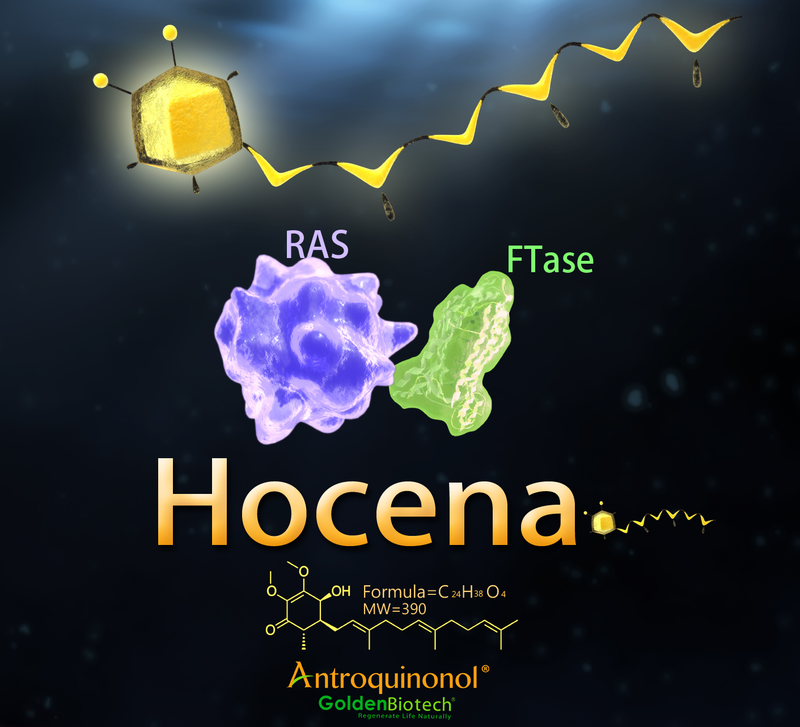 The ubiquinone-like structure of Antroquinonol® (Hocena®) was discovered in 2006 by GBC in Taiwan. This small molecule has been granted Orphan Drug status by the U.S. Food and Drug Administration (FDA) for the treatment of pancreatic cancer (#14-4608), acute myeloid leukemia (AML) (#15-4763) and hepatocellular carcinoma (#15-4881) in 2015. European Commission also grants orphan drug designation status to Antroquinonol® for the treatment of pancreatic cancer in early 2017. Furthermore, Antroquinonol® was awarded in pharmaceutical sector of Advance Queensland - Johnson & Johnson Innovation QuickFire Challenge for its potential as a treatment for Alzheimer’s disease in 2016. For IP protection strategy, the patent of Antroquinonol® covers all aspects such as total synthesis processes, Structure Analysis Relative (SAR), target diseases, and possible forms of derivatives and metabolites. As of April 2017, Antroquinonol® and its relevant therapeutic areas have been granted more than 100 patents in 40 countries/regions worldwide, including major markets such as the US, the EU, Japan, South Korea, Taiwan, and China. GBC has its own manufacturing plants to manufacture Antroquinonol® and finish product for use in clinical trials. The plants that manufacture Antroquinonol® and finish product for clinical use has been accredited with PIC/S GMP certification. In regard to the clinical status of Antroquinonol®, many clinical researches including oncology and non-oncology trials have already been started. For oncology trials, the Phase 2 global multicenter trials on patients with stage IV NSCLC who have failed two lines of anti-cancer therapy. The trial passed the first DSMB review in 2016 and finished in 2Q2018 with high safety and exceeding 50% DCR in clinical data. GBC received USFDA IND approval in 2017 to begin a Phase 1/2 clinical trial of Antroquinonol® in combination with gemcitabine (Gemzar®) and nab-paclitaxel (Abraxane®) in patients with first line metastatic pancreatic cancer. For the non-oncology trials, Phase 2 clinical trial of Antroquinonol® in the treatment of hypercholesterolemia and hyperlipidemia was kick-off in 2015 in Taiwan. This is a double-blind clinical study. The trial has been finished by August and decoded in September 2018 with the success in unblinding of clinical data. In addition, the IND application for two phase 2 PoC clinical trials in patients with chronic hepatitis B virus (HBV) infection and atopic dermatitis respectively have been approved by TFDA . These two trials are also double-blind clinical studies and expected to be finished by end of 1Q2019. At this year's Taiwan Healthcare+ Expo, GBC welcomes opportunities to collaborate with strategic partners in the pharmaceutical industry in further enhancing the research, development, and commercialization of Antroquinonol®.